The most economical way to travel around Japan is with a Japan Rail Pass - and it’s only available to visitors from overseas. It allows you unlimited travel on all lines operated by Japan Railways ( JR ) including the world famous “Shinkansen”. Only the super-fast, tilting, “Nozomi & Mizuho” trains are excluded from the Japan Rail Pass. Japan Rail Passes are available for either 7, 14 or 21 consecutive days unlimited travel. 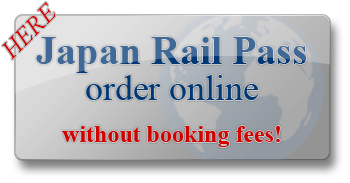 You can order your Japan Rail pass (exchangeable voucher) easily and quickly through Prime Travel. Since this amazing travel bargain is unavailable for sale in Japan, you must purchase the Japan Travel Pass before leaving home. Your pre-purchased voucher, can be exchanged at a Japan Rail ( JR ) ticket counter on arrival in Japan. Together with your voucher you will receive a useful information leaflet which also lists the stations in Japan, where your voucher can be exchanged for a travel document. This is best done either immediately on arrival or shortly before you plan to take your first rail journey. Most local trains and all all inter-city trains offer two travel classes. You can choose to purchase either a Standard Class ( known as Ordinary Class in Japan ), or a First Class (known as Green Class in Japan) Japan Rail Pass. Both are great value for money especially the Green Class Japan Rail Pass, which offers more space and comfort, which is especially important on longer journeys. When exchanging your Japan Rail Pass voucher, your travel document will be stamped with the date you wish to take your first train journey. Your travel document will be valid for either 7, 14 or 21 days consecutive travel. Please be certain of your dates when planning your first rail journey, as alterations cannot be made after you receive your travel document. Please note that the “Nozomi & Mizuho” trains are not included in the price of your Japan Rail Pass. “Nozomi & Mizuho” train tickets and express-line travel supplements are available for purchase in Japan at the regular fare. Special conditions apply to Japanese nationals! - online without booking fees! We can issue your Japan Rail Pass immediately! It takes only 10 minutes!